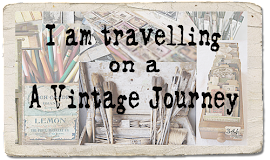 Hello fellow Vintage Journey travellers, Astrid here with another project to hopefully give you a bit of inspiration for your own Tim style journey. I have to say, with those ingredients in my travel bag, I could not wait to get started, because they all belong to my absolute favourites. I used the Shattered stencil and Hickory Smoke and Ground Espresso following Tim's Embossed Layering Stencil technique. 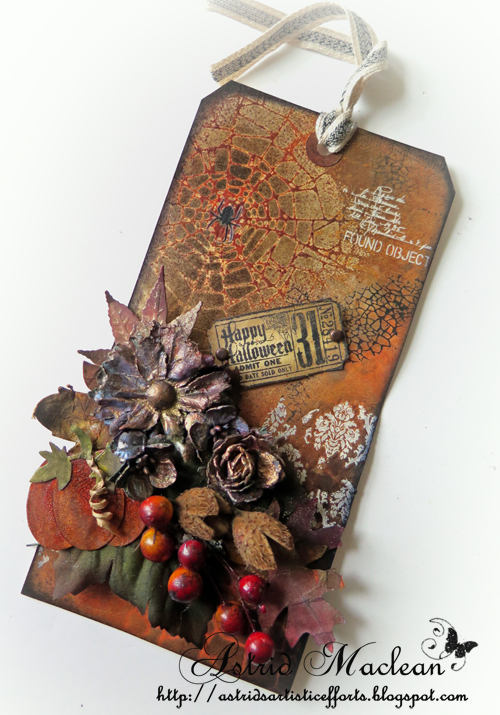 Given the time of year I decided I wanted to give my tag a Halloween/Autumnal feel, so chose Dried Marigold, Persimmon and Rusty Hinge as additional colours and used both the inks and sprays to create the rest of my background, using the Crackle Layering Stencil in the other corner of my tag. Using the sprays made for a lovely drippy droppy background, but I lost some of the details. In addition it also got a bit dark, so I added a couple more layers of background stamping with Rusty Hinge Distress Paint and Jet Black Archival, some more stencilling with the Crackle stencil and finally added some more interest using both black and white remnant rubs from the Apothecary collection. 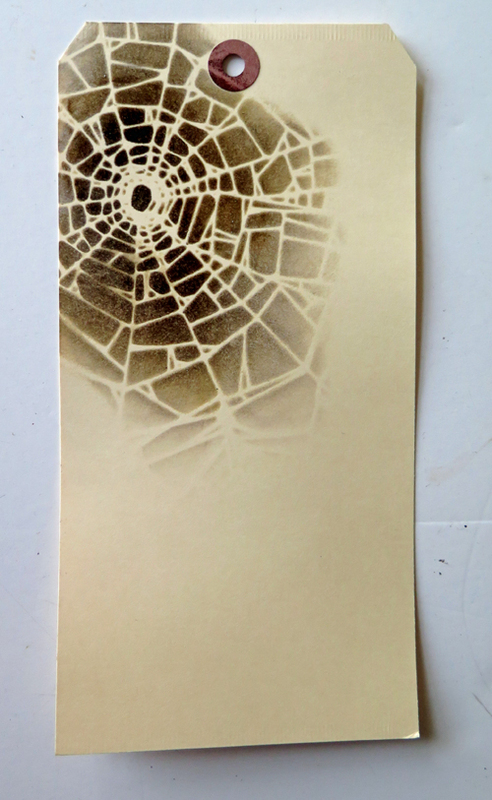 Now the Shattered Stencil always reminds me of a spiderweb, and so I put a spider from the Remnant Rubs in the centre. The new(ish) Remnant Rubs Tool is a godsend for this, thanks so much Anne for gifting it to me!!! 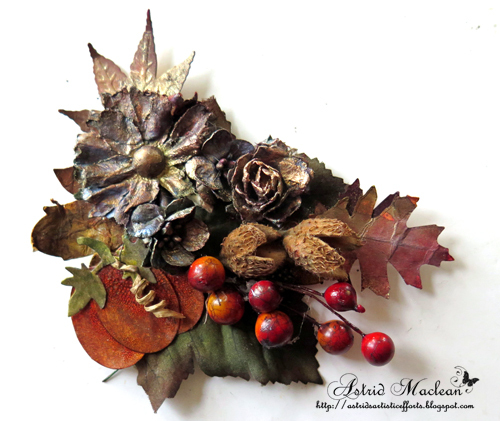 Now, even though I had chosen to go with a Halloween theme, I am not really a fan of the whole skeleton, zombie and skull scene, so I decided to keep more to the Autumn Harvest side of Halloween, and created an autumnal cluster using a variety of die-cut leaves, berries, some beech nuts and of course a pumpkin. 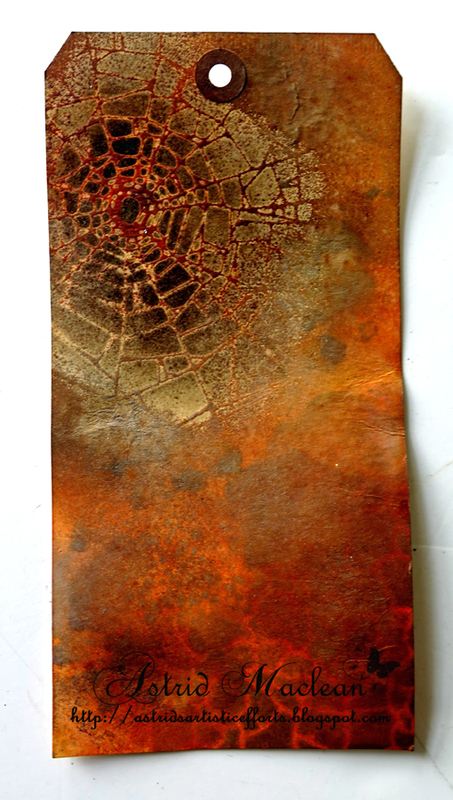 I used the same colours of Distress Inks to colour the pumpkin, added some Rock Candy Crackle Paint and when dry added a few spritzes of Ground Espresso Distress Spray to bring out the cracks. I created a ticket with a stamp from the Odds and Ends set, adhered it all to my background, added a bit of the Ideaology Trimming Black and Natural to the top and my tag was done. Well, thank you for joining me for the next leg of our journey this month, hope you enjoyed my project and remember, there is still plenty of time to play along with our latest challenge, Art Journalling with Tim. Hope to see you there and don't forget to come back here next Monday, when there will be another Inspiration post for you to enjoy. Unbelievably cool texture on that cobweb and the colours are glorious! Love the pumpkin made of ovals - clever stuff - and your gorgeous autumnal gatherings. Fabulous, fabulous tag! Fabulous with such a beautiful background , love the nature autumn feeling!! Just absolut stunning tag here Astrid. As always I just love, how you put it all together in one place and made this amazing tag here. Simply amazing and just sooo perfect together. Fantastic tag! I love the tip about the pumpkin. Gorgeous tag, Astrid. I love how you showed the steps and changed direction of the tag as it was developing. The added stamping, especially the white really brightened up what was already a beautiful tag. Love the added nuts, berries flowers to your pumpkin. Great crossover from Halloween to a combined autumnal theme. 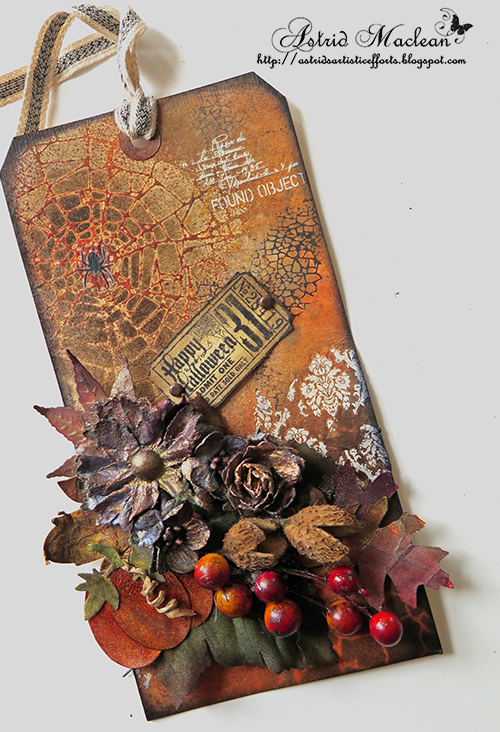 Astrid, what a fantastic Autumn tag and I love the added Halloween bits! The background is gorgeous and the white rubs really add such a nice pop of interest! Love the Autumn Cluster and your pumpkin is so clever! As always a great share! Hugs! WONDERFUL, BEAUTIFUL, with a bit of tangled yuk combined!!!!!!!!!!!! When I mow, here at the ranch, I am always getting spider webs on my face/body - hehehehe - so that's why I say - tangled yuk! Seriously, this is truly STUNNING Astrid. The colors and texture just FABULOUS. Never do I see one of your creations that I don't fall in love with - you are just so great at what you do girl! HAPPY HARVEST! 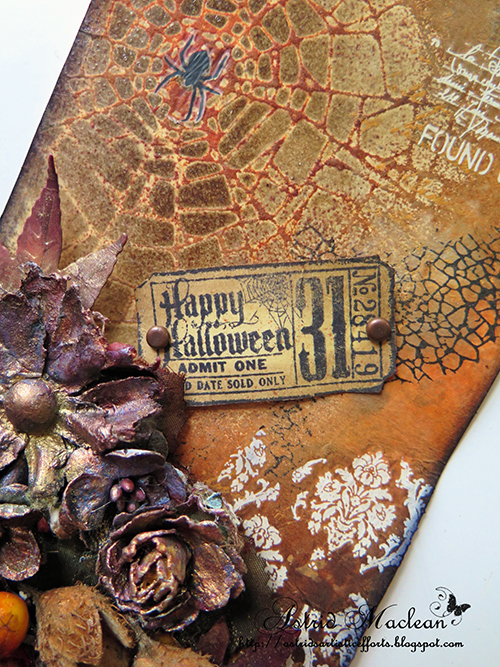 j.
Fabulous tag Astrid I much prefer your take on Halloween, great colours and texture. OMgosh golly, this tag is fantastic. Thank you so much for the incredible inspiration. 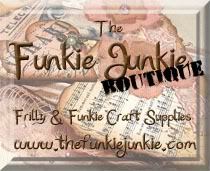 I really need to get my sprays and inks out and play! Happy Halloween to you! 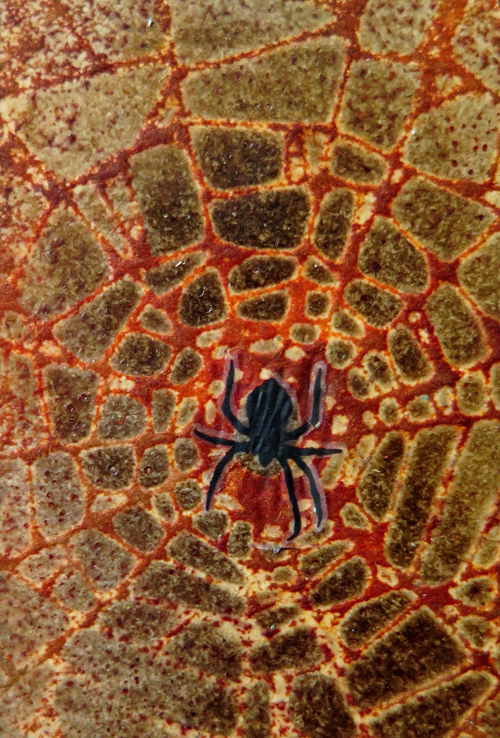 I love the spider web, so rich textures! And an amazing autumn harvest! 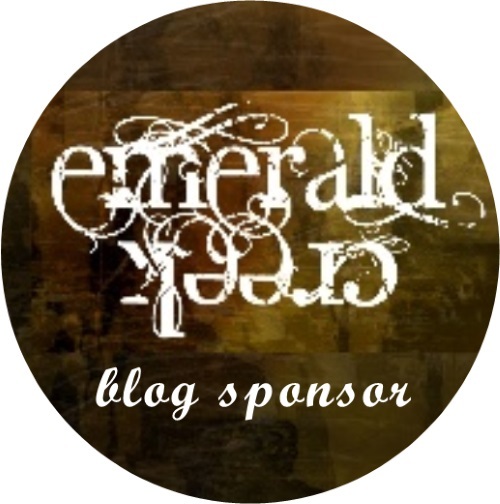 I love your elegant Halloween theme! The background is lovely, and I agree that the white really adds the perfect touch. I'm guessing it was hard to cover any of it, but your autumn spray is gorgeous! If this isn't beautiful, I don't know what is!!!! Outstanding Astrid! I am back for a second look- kind of like a second opinion when you know what it's going to be! Yep -- it hasn't changed one bit - still gorgeous! 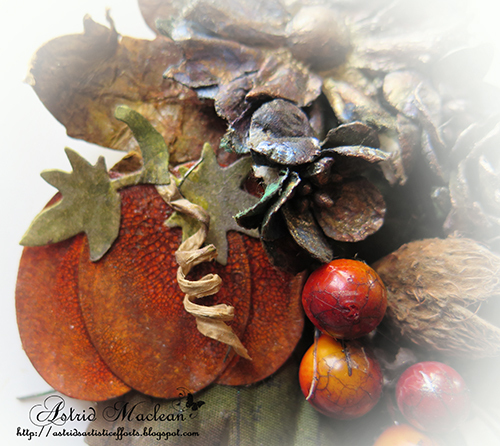 Stunning details and wonderful textures Astrid. A great step by step and I love the Harvest cluster. This is amazing as always Astrid I love the background and how you built it up. Just gorgeous... this is soooo beautiful! 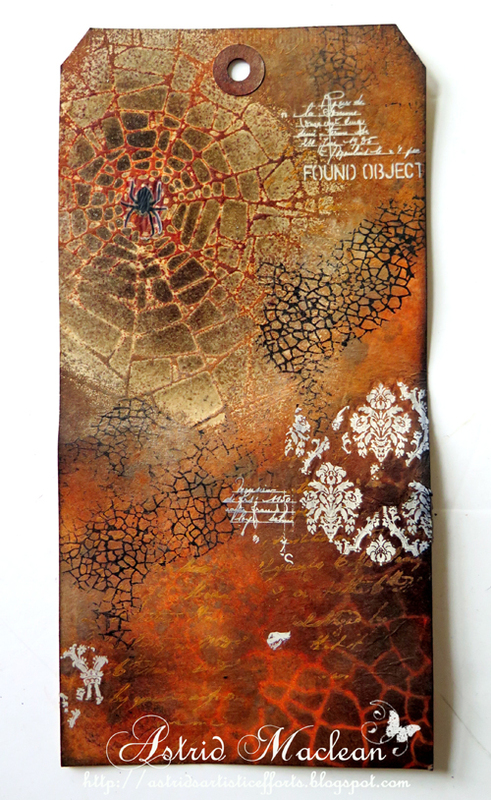 Stunning tag Astrid, loving the spider, textures and details. Astrid your tag is fabulous, awesome, fantastic. LOVE the colors and your background. Fantastic details. Astrid can I ask you how you made the flower in the beautiful cluster ? Did you use a pointsetta die ? Dark cardstock ? Added gold Mica, or how did you create it ... Please share how you created this gorgeous flower. Also where did you get the beech nuts from ? I dont live in a country where these would be easy to find in a forrest. Can you buy them on line somewhere you know of ??? I'm crazy about your cluster and would be very grateful for any help...please ?? Astrid - another stunner!! Love every detail and bit.